Obtaining a representative oil sample from a closed loop lubrication system is essential to any good oil analysis program. As oil analysis programs become more standardized for routine monitoring, especially within equipment warranty support programs, equipment makers provide more sampling points on new equipment. These access sampling points make it easier for operators to quickly and easily take representative oil samples. The best primary location to monitor in a closed loop system is AFTER the area of greatest wear/stress, and BEFORE the filter. This may be before the return line filter housing, or in the reservoir at the return line zone. Secondary sampling points may be chosen also, such as AFTER the filter, and may be used to evaluate filtration efficiency. Another sample point is the sump or reservoir. When sampling from lubrication lines, the sample should be taken from the “isokinetic line of flow” in the line. In other words the velocity of the oil at the point of sampling should be equal to the velocity of the oil at the midpoint of the line. A common sampling point to achieve this is on the elbow of the return line (fig 2-4 ). Where and how to sample hydraulic lines is detailed in the ISO 4021 for hydraulic systems. The pipe ideally will contain oil soon after draining from the wearing part. The flow rate should ideally be turbulent to keep particles entrained in the oil. The oil should be hot; do not sample after cooling. If the pipe is large and the flow is laminar, take a sample from near the center of the pipe to avoid the lower wall where old debris may accumulate. If the sample valve is installed with a dead leg line, be sure to flush thoroughly before collecting a sample. Take the sample from near the center and well clear of the bottom or the sides. Use a pitot tube attached to a sampling port installed on the sidewall to ensure the sampling area of interest is addressed. Be mindful of the extra dead leg in the pitot tube line – this must be flushed before the bottle is filled. Sometimes a special spring steel sample stick can be useful in placing the suction tube just where you want it each time, thereby gaining repeatability. The narrow flat steel bar can be fitted with a standoff to prevent bottom sampling, as well as clasps to hold the Tygon tubing. 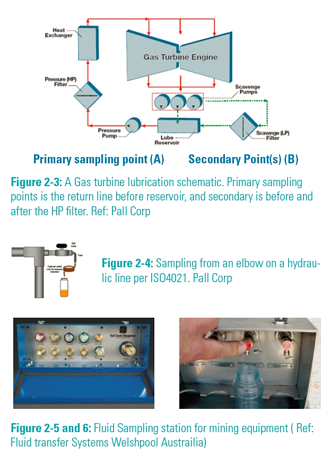 Sampling test ports are now the default standard for obtaining liquid oil samples from both reciprocating engines, hydraulic systems and rotating equipment (turbines, compressors, gearboxes, motors). Almost all new equipment has preinstalled sampling valves, particularly when vendors insist on oil analysis as part of the warranty program. The most common and popular style for general industrial and hydraulic sampling needs is the female test port designed to adapt a sampling probe. The brass or stainless steel valves have either elastomer seals or metal ball seat designs, able to withstand up to 5 MPa (750 psi sampling pressure dependent on the style. They normally come with JIC fittings, (SAE J514) that are standard for these applications. These ports are preferred for industrial applications because the valve accepts a large (4 mm) probe, ideal for sites where oil samples with high viscosities are encountered, and they also can be used with sampling thief pumps when installed on non-pressurized bath lubricated reservoirs, such as gearboxes. A similar type of pressurized sample port primarily used for reciprocating engines and transmissions in fleet applications is the needle valve (2 mm) test port (Fig 2-10). A small disposable needle valve is connected to the sampling bottle, providing a simple one step tool for drawing an oil sample quickly from an engine (Fig 2-9). Other variants in the market include push button valves. (Fig 2-11) These drain valves are used for oil analysis of reservoirs or sumps. Recently a new technology has become available calledLuneta condition monitoring pods,. These combine a sampling port/ tap and oil sight glass into one (Fig 2-12). These devices may be retrofitted to reservoirs and sumps to replace older sight glasses, and avoid the need for a separate sampling port. Older equipment (pre 1980 build) rarely had sampling valves installed, and so it was up to the maintenance personnel to configure a sampling point and methodology. Sampling thief pumps with Tygon tubing have been used for many years to sample reservoirs manually. The pumps are designed to create a vacuum in the bottle and cause the oil to leave a non-pressurized reservoir. DO Sample when machine is operating, or within 30 minutes of doing so. DO Sample from same point always. DO drain off dead leg oil/water/debris before sampling. DO NOT sample immediately after oil change or makeup. If you would like to read more click here to download our free Oil Analysis Handbook.